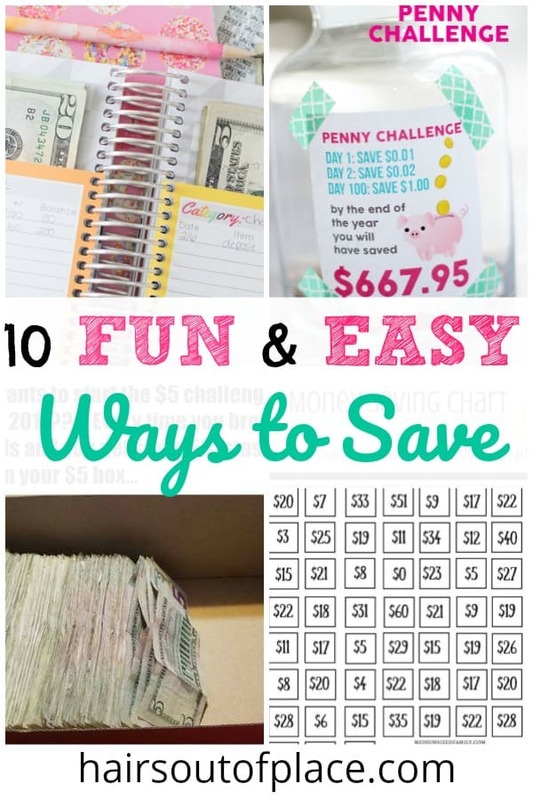 The Top 10 Most FUN Savings Challenges for 2019! 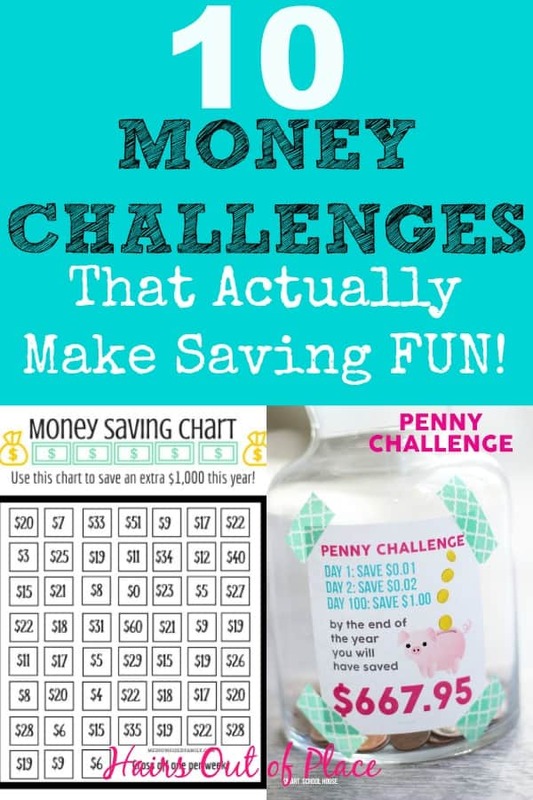 Money saving challenges make the best way to save money each year. Saving money isn’t always the easiest or most fun task, but simple savings challenges make the process so much better. I’m sure we can all think of other things we’d prefer to be spending our money on, but coming up with something like a weekly savings plan or monthly savings plan is key to help you reach your financial goals. Having a budget and a method of saving money that works for YOU are super important. What works best for someone else might not be the money saving challenge that works best for your life and style. I definitely don’t think there’s a one size fits all budget or money savings method for every person! If you need help creating a budget, definitely read our Budgeting for Beginners post that also includes a free printable budget for you to use! WHAT KINDS OF SAVINGS CHALLENGES ARE THERE? Here’s just a few to give you an idea! 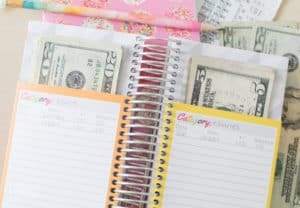 Whether you’re looking for a 52-week savings challenge or a monthly savings plan or just a save money challenge for a rainy day fund, we’ve compiled the best, easiest and most FUN money saving challenges out there! Let’s face it, saving money just isn’t the most fun task. But most of us don’t just have the cash on hand when our car needs a repair, we get invited to a fun concert, or your phone breaks and you unexpectedly have to replace it. We all have different interests, different learning styles, have different salaries and all have unique life experiences and goals. Because of these differences, I researched the best 10 money saving challenges and I’m pretty sure there’s one that works for every person and savings goal! So whether you prefer to save your coins, extra bills, use a structured plan or do something random, we know we can help find a money savings challenge that’ll work for you! This is one of my favorite ideas, so I featured it first. YOU get to pick which amount you’re saving each week! Simply cross off what works for your budget that week and turn it into a fun, realistic game! You can download this fun and free printable here, which also adds you to our lifestyle and money newsletter! it also gives you free access to our reader printables library that includes over 50 printables for you! 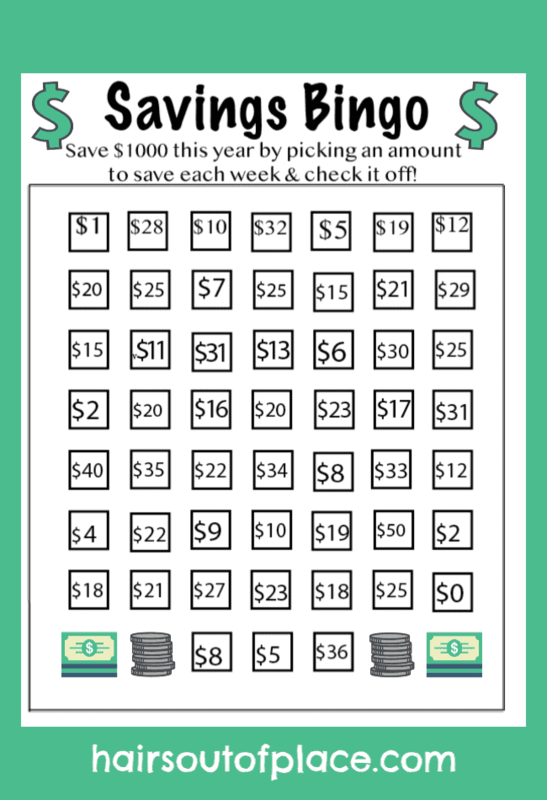 By checking off and saving an amount each week, this $1000 savings challenge has you saving for 52 weeks. You can easily turn this into a 3 month game by saving little amounts multiple times per week OR you can add zeros to the end of the numbers to to save $10,000 this year instead! This money savings challenge is perfect for someone whose income varies and you need flexibility. As long as you follow the rules and fill all of the boxes once per week, this is a 1 year savings challenge. My husband does a yearly change jar challenge. He carries a wallet but doesn’t want to carry change, so he drops it in his money jar. Every December he counts his coins, and he’s always pleasantly surprised to realize he just saved HUNDREDS of dollars with minimal effort! 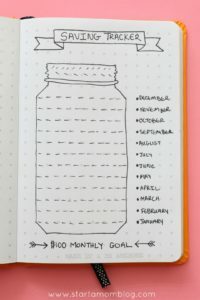 One of my 2018 goals is to start a bullet journal, when I came across Suzi’s post, I knew I had to include it in my ideas on how to save for little goals. I highly suggest checking out her entire post about saving money! It’s quite inspiring! What I love about a bullet journal money challenge, is you can choose whichever amount works for your budget. Here’s the challenge we’re doing for 2018 and the reason I love it is because it starts out saving a really small amount. 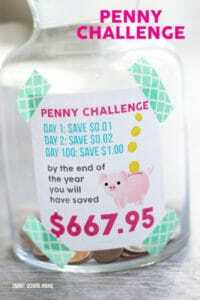 You can read more about this savings idea in my money challenge post and even download a tracking spreadsheet. This gives people who aren’t used to budgeting and tracking money time to develop new habits and start slow after the crazy holidays. As you develop positive savings habits, you can work during the year to cut out unnecessary expenses. 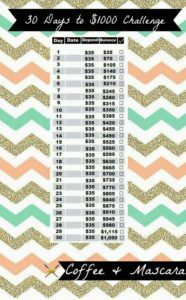 This is another money saving challenge that you can easily add on a ZERO at the end if you want to save over $10K this year instead of $1K! What I like about this challenge, is you get the hardest part out of the way right off the bat! The amount you save lessens over time, so by the end of the challenge and possibly during the holidays, is when you have the easiest savings goal. It’s basically the reverse of the money challenge post I wrote about above, but again, the reason I listed 10 money challenges in this post is so you can find the best one for YOU! Savings Goal: Up to You! If you’re a cash saver, whether it’s $1 bills or $5’s or change like my hubby, saving your extra coins or cash until your jar or box is full, is an easy way to save without following an exact dollar amount! So for those of you that love to work with cash and want to keep your extra money at your home, the cash envelope system is the perfect savings challenge! This is a great savings challenge for those with more aggressive savings goals or who have quite a bit to save each month. If you follow this for the whole year, you’ll end up with $12,000! 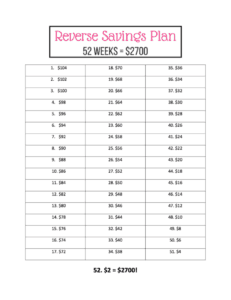 For those of you who prefer to save money when you get your every other week paycheck, a bi-weekly plan is a great savings solution! At the end of the year with this plan, you’d end up with an extra $5K. No photo to share, but you can read more about the bi-weekly savings challenge here. For myself, the best way to save money is to plan for it in my monthly budget. We save a set amount each month and automatically have it transferred to either a savings account or retirement accounts. This method especially works well with larger financial goals. I still believe this is the best way to develop good financial habits and to make sure you’re paying yourself first! For my daughter, Madi, who is 22, her savings plan is to live off of her paychecks and the tip money from one of her jobs is what she saves. Both of us have a system that works, that are unique to our own personal preferences. What’s your system? I’d love to hear about it! But what about for those little extras? That system seems to make the most sense for retirement goals, college planning, or saving for a down-payment but what about for smaller goals like a new laptop, short get-a-way, an emergency fund or new appliances? That’s where the fun and easy challenges come in! Whether it’s saving your change and filling up a jar, using a cash envelope system, or saving a varying amount each week, there’s a fun method to save for smaller goals that’ll work for most everyone! 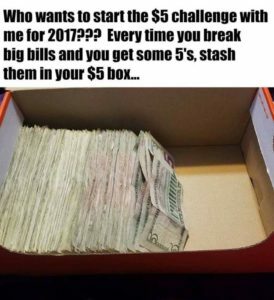 When I was growing up, my uncle’s favorite money challenge involved a wooden box he’d make himself. He drilled a tiny hole in the top that was just enough to roll a bill and push it through the slot. This money savings box had NO way to open it and you literally had to saw into the box to access the money! He’d make himself a new wooden savings box each year, and each week he’d take spare bills and add them to his box. At the end of the year, he’d break into it and however much he saved would pay for a small trip. How fun and clever is that? So Where Does This Money Extra Money Come From?? So are you wondering WHERE to get the extra money for your savings challenge? That’s often the hardest part! Almost everyone WANTS to save, the problem for many is how to get yourself to a point where you have extra to get yourself started! 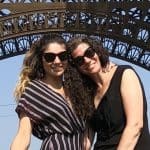 We’ve been living off of one income for over 16 years, and man, some years were really tough! I’ve ALWAYS had a side hustle to help with extra expenses, save a little money and pay for kids extras. So basically, the exact type of small savings goals that are perfect for a small savings challenge! Who doesn’t have little extra expenses come up almost every. single. month. So if unplanned expenses come up monthly for most people, how do people ever save money?? This is why I think it’s extremely important for people to have a second income source, even if it’s $200 extra per month. Again, because we live on one income and have a super supportive spouse, the money I make from blogging helps with little projects around the house, helps me save to replace the hand-me-down furniture and eventually will help to for trips. I made over $500 within my first 3 months of blogging combined and was making an extra $1000/mo working part-time after 10 months. Our finances might change as our youngest heads to college in two years, so it’s my 2 year blogging goal to be making over $3000/mo by next year. Is blogging a make money quick plan? Nope! But the beauty of blogging is it’s YOURS and it can be whatever you WANT it to be and there are SO MANY different ways to make money with a blog. Plus, whether you have 7 hours a week or 30 hours per week, it’s a flexible job that works around your schedule and life. What’s awesome about surveys is anyone can do it. When you’re waiting for a kids sports practice to get done or watching TV or even on the exercise bike at the gym, it’s easy to knock out a few surveys. If you’re retired and want a few extra easy bucks, surveys are perfect for that! I’m even getting my teen son started on surveys; why not teach them young to help pay their own expenses and earn a few extra bucks? My favorite survey company is Pinecone Research, they’re considered one of the best, the surveys are actually interesting and you make $3 for each one you complete! The best part? You can even cash out at $3! Harris Poll– By signing up with Harris Poll, you help shape policy for government agencies, large corporations and non-profits. Our two favorite apps that give you options to earn extra cash in more than one way are Inbox Dollars and Swagbucks. Not only can you take surveys to earn money, you can also earn money by playing games and watching videos. When my kids were younger, being an eBay seller was the main way I paid for extra expenses and activities for the kids. One year, between credit card travel rewards points and doing well on eBay, I paid for our family to go on a 10 day vacation to Maui! I started out by selling our extra items from around the house and expanded over time. If this is of any interest to you, be sure to read my detailed post on EXACTLY what I did to make over $1000/mo flipping toys on eBay. Awesome post. This Affiliate link is varied helpful. We love your Content it’s good qualities content.